Justifying variations to a client can be one of the most difficult parts of a job. But it doesn’t have to be. 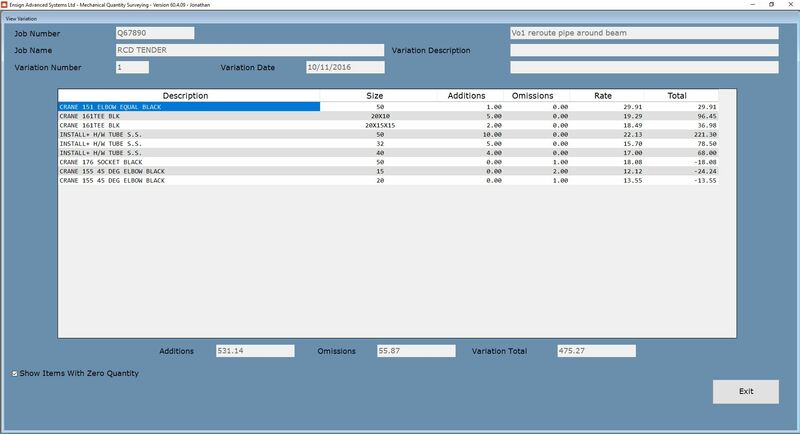 Ensign’s insulation quantity surveying software seamlessly integrates with our insulation estimating software and will pull through job and section values and schedules of rates automatically, saving you time when setting up your projects and easing your cash flow by removing any excuses the client might have to reject your application for payment. And raising your applications for payment is a quick and easy process with our QS software, which will help you get paid on time by producing detailed and comprehensive reports on your variations, taking account of adds and omits, plant hire, star rate items, day-work and more, to ensure your clients can see exactly what you’ve done on each project. Not only that, but the software will save you an awful lot of time and effort by not having to calculate everything manually. With Ensign’s PDF TakeOff Software, variations can be measured directly on your drawings and then imported into the Quantity Surveying system to give you instant and highly accurate variation calculations, with the PDF drawings acting as additional proof of the variation itself. Naturally, Ensign will set up the software for you, taking into account your specific business needs, and we’ll also provide one-to-one, bespoke training on our software so you know how to get the most out of it. And if you have any queries at all, our friendly and professional team are on hand to give you all the support you need. Why not lose the variation headaches today? Give us a call and see how we can help you get paid on time.